Nothing seems to move so slowly as the gradual warming to an idea, especially one that is beset on all sides by deep-seated skepticism as to how legitimate and worthwhile that idea really is. Such was the case with rock ‘n’ roll music in some quarters during the fall of 1947, or at least that’s how it could seem at times such as this, when one of its most promising artists was stuck in a holding pattern not entirely of his doing. 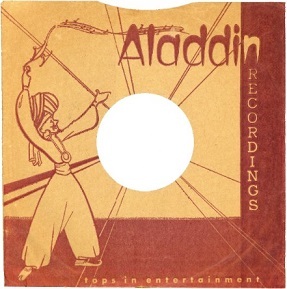 So now less than a month after his first release in the rock era we see Aladdin Records hastily throw another Amos Milburn single into the marketplace, one offering little or no variation on what he’s just put out and which clearly was a decision by the label that was made with no real foresight, or even an awareness of what was sitting right in front of them, a style waiting to be defined by the artist who presaged the entire rock movement a year earlier. You almost get the sense that things which are out of his control seem to be somehow conspiring against Milburn, preventing him from making a truly decisive statement, one which will leave absolutely no doubt as to his own vibrancy as an artist and the potential of rock ‘n’ roll in general. Why Don’t Somebody Listen To My Plea? There’s never a credible reason to NOT want to hear a Amos Milburn record, especially when he’s just about entering his prime (though of course at this point nobody outside his own mother would’ve gone out on a limb to dare suggest such a thing), for even at this early stage of the game it’s pretty clear he’s always got some good idea brewing under the surface, while his vocals and piano playing – along with Maxwell Davis’s sax – are all but assured of being compelling. And they are here as well. The piano that opens it is simple but remarkably evocative, sort of a staggering progression that could conceivably lead anywhere – jazz, classical, you name it – heightening your anticipation before Milburn’s voice, already weary with self-torment and frustration, enters and sets the scene of his misery (with a title like Sad And Blue you didn’t expect it to be a party jam did you?). Davis’s smoky saxophone, always the measure of well-judged restraint, follows with sympathetic responsorial lines and is aided in this cause by a subtle spanish tinged guitar, the three instruments combining to create the sound of late night resignation. Close your eyes and you can easily visualize Milburn in the corner of some dimly lit club as the last of the patrons are making their way to the door, the din of the night’s activities now just a fading murmur while he nurses his last of about a dozen drinks, an ashtray full of cigarette butts never out of his reach while his eyes remain at half-mast in quiet far-off contemplation. It’s a sorrowful sight for sure, but one that we can turn away from either as he seems to be floating about aimlessly in a netherworld of hazy regret, resigned to his fate and completely unaware, or unconcerned, that anybody is paying the least bit of attention to him. As emotional voyeurism goes this is gripping stuff. Arguably nobody in rock’s formative years had better vocal control than Amos Milburn, his ballad singing in particular was an ongoing lesson in the use of dynamics that by all rights should be a graduate course for aspiring singers to study. Amos never rushes a lyric, judiciously using pauses to build anticipation for the next line. Though his voice was always strong and clear, he also knew the effectiveness of singing softer to force the listener to focus intently on every line to fully grasp it all. More than anything he was a master at creating tension even with the skimpiest of material, as is the case here, where by the end of the song Milburn hasn’t left his seat in that club, the girl is long gone and it’s obvious he’s never going after her, yet we’ve remained transfixed by his mournful self-indulgence all the same. There’s no “story” here in the traditional sense, it’s all just an illusion of light and shadows, and yet we don’t mind in the least because we were so captivated by him while he expounded on his despair that we probably picked up his bar tab by the end of the night because we felt sorry for him. Yet for all we know it was just an act to GET us to buy his drinks in the first place and he’ll probably pull the same trick tomorrow night and the night after that… and the night after that. Different bars maybe, even a different story perhaps, but the same result and nobody will complain. And I’m not complaining here… exactly. Make no mistake, I am glad to have this, glad it exists and glad we get to review it so others can perhaps be pulled under its spell. Sad And Blue is a good performance in every regard and further evidence that Amos Milburn’s talents took a back seat to no one in rock. He manages to put flesh and blood into a rather skeletal composition and somehow make it breathe, and once again does so in such a way that you barely notice the effort. In many ways these types of performances can be the most rewarding as it’s a record that bears fruit for repeated concentrated listening allowing all of its subtle charms to slowly work their way into your consciousness while you’re lulled into a drowsy acquiescence by the atmosphere he conjures up. This is a sublime piece of craftsmanship, alluring in a way that we haven’t really seen yet by anyone in rock… other than Milburn himself that is. And that’s why I’m frustrated with its appearance here at this specific moment in time all the same. Because it IS something we’ve seen before from him, just a month ago no less, and therefore it serves no real purpose, it only re-establishes what we already know of him. The record’s not an artistic misstep as much as it’s a commercial misstep. The blame falls on Aladdin Records for not realizing this. The simple fact is that in a market which is just evolving, where ground is gained or lost with each new release, Sad And Blue simply didn’t advance anything. Not Milburn’s reputation, not his commercial prospects, certainly it gave no notice of his versatility which was his strongest asset but one being ignored at this point as they put out one forlorn lament after another. Though he does this sort of thing very well he simply needs to create a bigger explosion at this stage of the game to make his presence known, as well as to claim more territory for rock ‘n’ roll itself going forward, and this clearly isn’t it. It’s nice, quite nice actually, but it’s redundant. Leave a reply on "Amos Milburn: “Sad And Blue”"